Donald Trump acted like a "drunk tourist" who was "loud and tacky" when meeting with foreign diplomats, according to a new report. At least that's what a U.S. State Department Official told the Daily Beast following the president's first trip abroad. 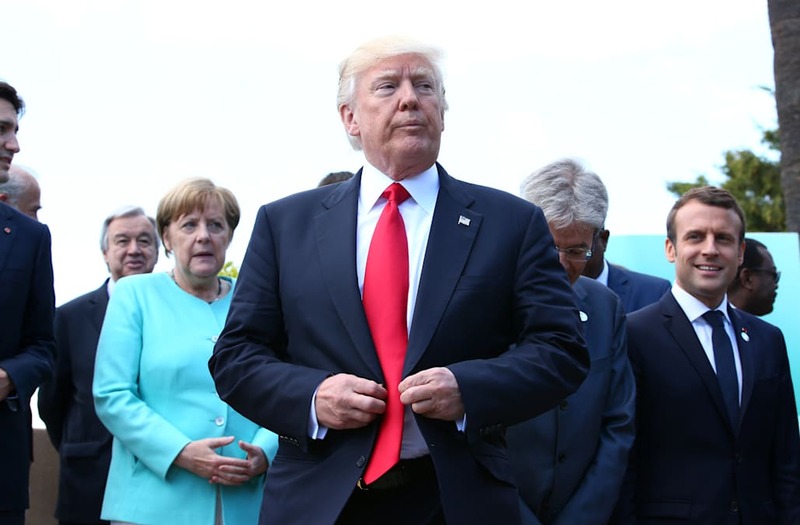 The unnamed official said other world leaders were frustrated with Trump's "arrogant" stances on climate change, taxes and security and part of that lack of diplomacy led German Chancellor Angela Merkel to declare the end of the U.S. alliance with Europe. The United States is the only country out of the seven G7 nations that didn't agree to stick with their commitment to implement the 2015 Paris Climate Agreement. #Outnumbered Trump singing the national anthem during today's Memorial Day ceremony - the late night shows have lots of material tonight. @frangeladuo @SMShow Anybody catching this Memorial service @ Arlington with Dopey Trump singing and swaying like it's a pep rally? WTF? #Arlington good Lord, someone gave tRump some happy pills today (singing). Its a somber moment you fool. Will he ever stop embarrassing us? Trump at Arlington, mugging & singing for cameras is sickening. For those who haven't been, it's an incredibly solemn site. Deserves more. So trump is dancing and singing to the national anthem at Arlington Cemetery.......what do I even say to this? trump not looking somber at all. Bobbing head, all smiles,and singing. This embarrassment is always inappropriate. Trump singing along to the national anthem at Arlington is the highlight of my day. I absolutely love it during the national anthem you could see Trump singing the words I don't even think Obama knew the words. Trump rocks! The accord is aimed at slowing global warming. Trump did say he needed more time to decide if the Unites States should abandon the agreement. The official went on to say Trump shoving the Prime Minister of Montenegro aside to stand at the front of the NATO leaders and the president's unusually tense handshake with France's new president are just examples of Trump stepping on others without him realizing it. President Macron said his handshake with Trump "wasn't innocent." More than one European official called Trump's appearance a disaster. Trump himself said he was pleased with the trip -- tweeting @realDonaldTrump "Just returned from Europe. Trip was a great success for America. Hard work but big results!"